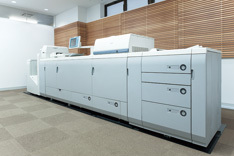 Nippon Paper's Research Laboratory has prepared comprehensive systems that enables us to evaluate printing from a standpoint close to our customers. 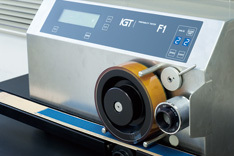 To accurately assess the requirements sought for printing operability and quality, the Research Laboratory has introduced a variety of production-type printing presses and evaluation equipment, with which it performs varied printing evaluations. For commercial printing and publication printing, we evaluate paper quality and conduct tests to recreate printing problems under conditions close to those at printing factories, using mainstream web-fed offset rotary presses and four-color sheet-fed offset printing presses. In addition, we have fitted the printing presses with various sensors for control and analysis, and employ plate-making systems to perform evaluations using optimal printing patterns for each purpose. Going beyond evaluation of newsprint and business paper communication, the Research Laboratory is making efforts to evaluate printing in the many paper products that the Nippon Paper Group creates. We have a flexographic (rubber letterpress) printing machine used for cardboard boxes, paperboard, and paper-based liquid containers. The Research Laboratory is equipped with printing test machines to evaluate the printing on these paper types. Its systems for evaluating diverse printing methods includes on-demand digital printing presses based on the electrographic method, a type of equipment that is seeing increased use worldwide.